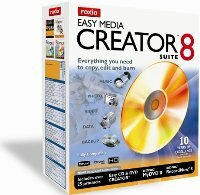 NEW Easy Media Creator 8 Suite enables you to do more with your digital media because it's faster, more flexible and more compatible than ever before! With fully integrated technology from over twenty premium products, Easy Media Creator 8 Suite enables you to edit, back up, burn and copy all of your video, photos, music, and dataseamlessly. So, whether you are sharing your favorite memories with friends and family, or archiving and preserving your valuable data for future use, NEW Easy Media Creator 8 Suite is still (and always) the best choice for easy access to powerful burning software. Create your own mixes, manage your music landscape, personalize your playlist, and share it with anyone you want. You choose how, what and where you want your music, and Easy Media Creator 8 Suite gets you there. Easy Media Creator 8 Suite helps you preserve and share your most precious experiences. It's easy to organize and keep track of thousands of digital photos. Import, edit and share it's easy enough for anyone. Make every project unique and your memories unforgettable. Finally, novices and experts alike can easily turn home movies into professional looking DVDs, complete with navigation menus, and buttons -- just like a real Hollywood DVD! Easy Media Creator 8 Suite takes the hassle out of video with drag and drop ease. Back up with confidence, secure it with ease. Now truly keep your data safe, because Easy Media Creator 8 Suite includes the award-winning Backup My PC. Its the easiest way to completely backup your digital media and other critical files. Designed for non-experts, in the event of a computer failure, it will recover your valuable data, email and even your operating system! • Automatic or manual backup. Your choice. Burn. Copy. Label. Now easier than ever! Burn it, copy it and personalize it with Roxio's reliable burning technology. Burning data, audio, photo, video CDs and DVDs has never been easier.